Businesses can easily accept credit cards online with one of the many user-friendly and affordable tools available. Payment processing solutions like Square, PayPal, and Shopify help retailers accept credit cards online in a few minutes, with minimal upfront costs and processing rates that don’t break the bank. If you’re new to credit card processing, we suggest you check out Square. Square is an all-in-one payment solution that covers virtually every small business need, in-store, online, invoicing, and mobile. Best of all, it’s free to create a Square payments account and to set up a basic website through Square to accept credit card payments online. Create your free account today. To accept credit card payments online, you need a tool to collect customer data and a way to process the payments. Most ecommerce businesses do this through a website. Depending on your hosting service and platform, you will have different payment options available. For example, if you have a WordPress site, you can use a shopping cart plug-in with PayPal and/or Stripe to accept credit card payments. If you don’t already have an ecommerce website, you can build one with Square’s Weebly or Shopify. For small businesses, we recommend using a solution that includes at least both the payment gateway and merchant account in one system like PayPal or Stripe. Many other providers, such as Square and Shopify, offer a website solution, payment gateway, and merchant account all in one. There are tons of providers of online credit card payments, and they each operate a little differently. So, we have specific steps for each provider below. For a more thorough breakdown of each of these components, read our article on How to Accept Credit Card Payments in 4 Steps. Square is our top choice for businesses that want to accept credit cards online because it is very affordable and has an intuitive interface that is super simple to use. Square is also our recommended point-of-sale (POS) system, so it is a natural fit that storefronts who want to sell products online as well use the same tool for all of their sales channels. Square is the best fit for small and startup businesses that want a solution that has no monthly fee, minimum transaction requirements, or application process. Square makes it easy for small businesses to accept credit cards online by offering a few different solutions, all with no contract. Businesses can create a website with Weebly through Square, connect Square payments to one of their ecommerce partners like WooCommerce, BigCommerce, and Wix, or use Square application programming interfaces (APIs) to add Square Checkout to your custom website. Sign up for Square Payments: It’s free to create an account which includes a basic POS system for in-store and mobile sales, and businesses only pay a payment processing fee. There are no software fees or monthly minimums. Click here to create a free account. Create a website or ecommerce store: Square has a partnership with Weebly, so you can set up a website with an online store in minutes with a new domain or transfer an existing site over to Weebly. Square offers a free basic Weebly site or ecommerce options for a monthly fee. This is a great option if your primary sales channel is in-store, but you want to offer customers the option of buying online. Square also integrates directly with popular ecommerce platforms BigCommerce and WooCommerce. This is a good option if you sell in-store with Square, which is our recommended brick-and-mortar POS system and also want to grow a sizable ecommerce store. Finally, Square can also be added to any custom website through Square’s open API. This is a good solution if you already have a custom website built for your business, but do not currently accept credit cards online. Load your products and start selling: If you’re creating a new site through Weebly or an ecommerce platform, load the products you want to sell on your site including product photos, product descriptions, and pricing. If you’re setting up to take payments with Square’s API, drop the code in your existing site to set up a payment. 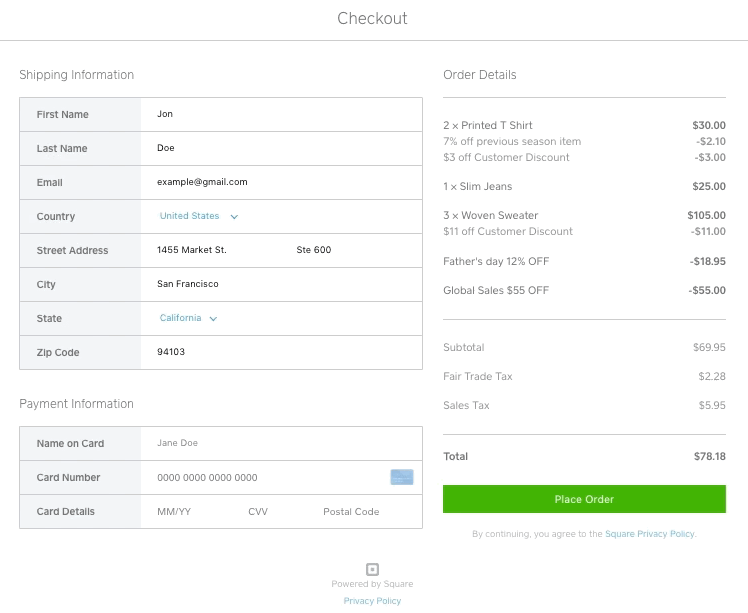 Example of a checkout created with Square API. 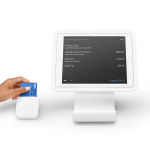 Square is a top-rated all-in-one payment processing and point-of-sale system for many reasons. Square gives businesses a variety of transaction options and a suite of business management features. Unless you sign up for the Professional or Premium Weebly plan for your ecommerce site, there is no monthly fee for Square. Businesses can create a free site to process payments, and only pay a flat-rate processing fee of 2.9% plus 30 cents. 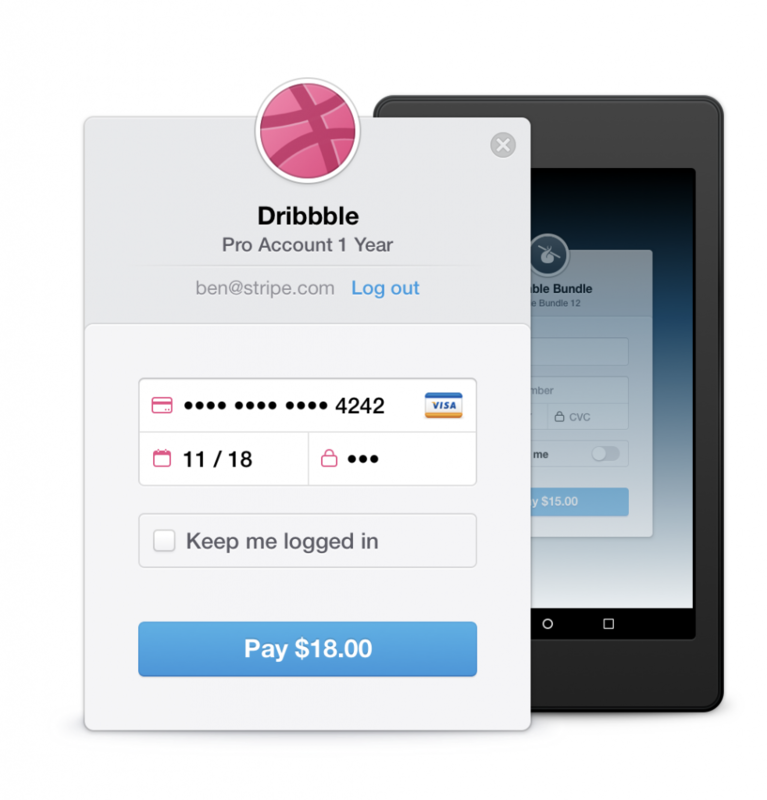 Square’s flat rate fee is the same as many online payment processors. Business owners love Square’s payment processing service and the free POS tools that come with it. Reviewers also love that the system is easy to use and is affordable with transparent pricing. Customer service is the main drawback with customers. Several reviewers say that getting in touch with Square’s customer service team can be difficult and frustrating. Visit our Square review page for more feedback. Square is free and makes it easy to start accepting payments. First, sign up for their free account. They even provide a free online store, which is ideal for brick-and-mortar or in-person sellers looking to create an online sales channel. Overall, Square makes it easy to sell online. Click here to get started for free. PayPal offers a processing solution for businesses to accept credit cards online, in-store, and via mobile. PayPal is great for online sellers because, in addition to traditional credit card payments, it also allows businesses to accept PayPal payments, which can increase overall sales by giving your business a higher conversion rate. PayPal is the best way to accept credit cards online for businesses that want to increase conversions by accepting PayPal payments with a one-click button at checkout. PayPal can be used with custom websites, integrated with one of their ecommerce partners, or added as a PayPal button to existing sites. PayPal is unique because it can be combined with other payment processing solutions if you want to accept PayPal payments but want to use another credit card processing service. With a PayPal ecommerce partner. PayPal works with Shopify, Big Commerce, and Magento. PayPal customers that build ecommerce sites through one of these platforms can receive a discount and seamlessly connect a PayPal checkout. On a custom website. 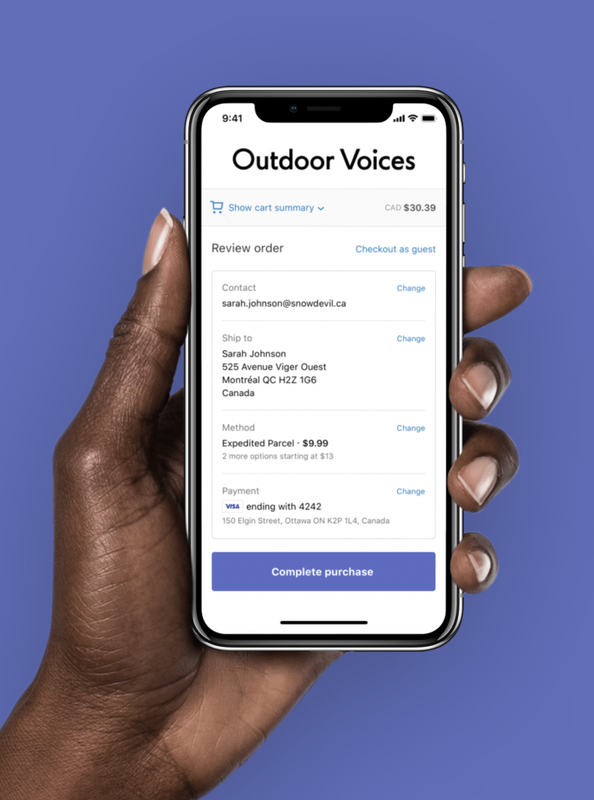 PayPal Payments Pro offers a fully customizable checkout solution for accepting all major credit cards, debit cards, PayPal, and Venmo online payments. This is a full online checkout solution that can be added to any website. With a PayPal button. Businesses can add a PayPal button to checkout to provide a simplified checkout solution. PayPal is a great way to accept credit card payments online because shoppers who opt for PayPal checkout, which makes up 20% of all ecommerce activity and don’t have to enter credit card or shipping information manually as it’s populated automatically by PayPal. Online shopping has very high cart abandonment rates and eliminating the steps customers need to take during checkout can help decrease abandoned carts and increase sales. PayPal has the same 2.9% plus 30 cents flat rate payment processing fee as Square, which is the industry standard rate. PayPal offers two different plan options for businesses that want to add a simple checkout box or checkout buttons ― PayPal Payments, which is free ― and businesses that want a fully customized checkout page, which is PayPal Payments Pro at $30 per month. PayPal has solid reviews. Businesses like that it is easy to use for them and customers. Customers like that PayPal offers a simplified checkout, and they don’t have to type in all of their card and shipping information. Some negative reviews report poor customer service from PayPal Payments. Visit our page on PayPal reviews to read more feedback from business owners. PayPal’s Standard plan is free to use, just like Square. PayPal offers more payment options in addition to traditional credit cards, including PayPal and Venmo. Plus, PayPal transfers funds to businesses immediately. Click here to set up a free PayPal business account. Dharma is a traditional merchant services provider that offers payment processing solutions to accept credit cards in-store and online. Dharma has a very selective application process, but if you are approved, it offers the lowest payment processing rates out of all the other options on our list. So, Dharma is the best choice for established higher-volume businesses looking to save on payment processing fees. In addition to having extremely low processing rates, Dharma has lots of tools that make it easy to accept credit cards online. Apply for a Dharma account. The first and most important step is to apply for a merchant services account with Dharma. Unlike Square, PayPal, or Shopify, which anyone can use to accept payments, Dharma is more particular about who they work with. But, Dharma has very low processing rates and excellent customer service reviews, so it is well worth the inquiry. Install on your website. Once you have an account and a chosen payment gateway, connect it with your website so that you can start to accept credit cards online. If you are using a major web hosting service like WordPress or an ecommerce platform like WooCommerce, always check to see if there is a plug-in or direct integration option. Otherwise, Dharma offers step-by-step instructions for connecting an NMI checkout to your website. Dharma is a great option for businesses that are already established and looking to save on card processing rates for in-store and online sales. Dharma’s free MX Merchant lets businesses create custom payment links. 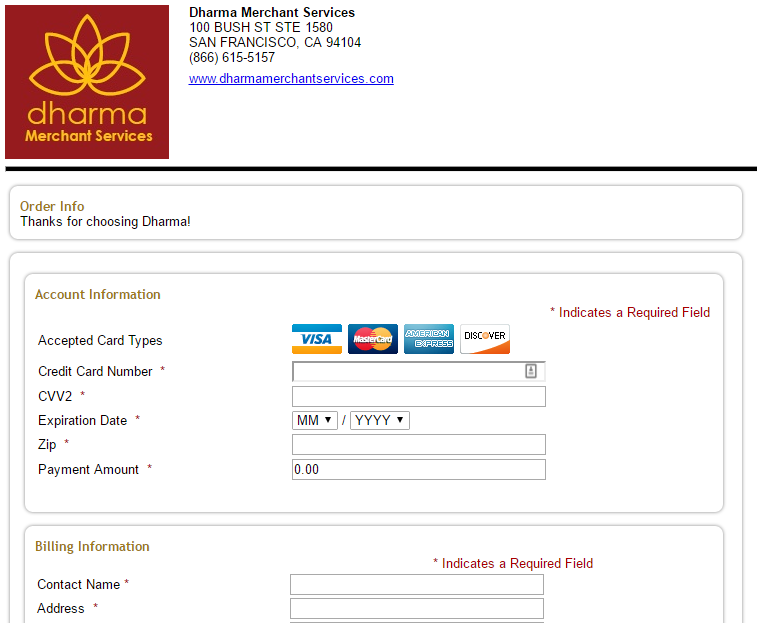 All Dharma merchant accounts receive the same interchange-plus pricing. Dharma’s payment processing rate is 0.20% plus 10 cents plus interchange per transaction. As an example, Visa’s interchange rate is 1.51% plus 10 cents for credit transactions. So, the amount per online transaction would be 1.71% plus 20 cents. Plus, Dharma charges a flat $20 per month fee. These types of rates are typically only available to larger businesses and on a custom quote basis, so Dharma stands out by offering these rates transparently and across the board. In addition to Dharma’s transaction pricing and the flat $20 per month fee for online payments, there is also a fee for the payment gateway. The exact price will vary based on what solution you choose. MX Merchant does not have a monthly fee, but you can pay to add on extra features like recurring payments and invoicing. NMI and Authorize.net are both $20 per month and have a .05% transaction fee. Overall, Dharma has excellent reviews, which is not common for payment processing companies. Businesses are happy with the level of transparency Dharma operates with, including publishing all rates and fees upfront. Businesses also report great customer service and helpful tech support. There are a few negative reviews citing equipment compatibility issues and other negative reviews from business owners who were rejected during the application process for a Dharma account. Visit our Dharma review page for more details. Dharma is one of the most affordable payment processors available to small and medium-sized businesses. To get started with Dharma, first visit their website and make sure it is a good fit for your business. They clearly outline what they consider high-risk and what types of criteria and documentation they examine when considering a business. Click here to fill out a contact form to talk with a noncommissioned representative and receive a free cost comparison. Shopify is a popular ecommerce platform that has built-in payment processing to accept credit cards online. Shopify accepts all major credit cards. Businesses can also set up gift cards and other payment types. Shopify is a terrific way for ecommerce businesses to accept credit cards online because it combines payment processing with ecommerce tools like a drag-and-drop store builder, shipping solutions, and inventory management. Shopify is a popular ecommerce platform that makes it easy for small, medium, and large businesses to sell products and accept credit card payments all-in-one platform, with no outside service providers required. Create a Shopify store. 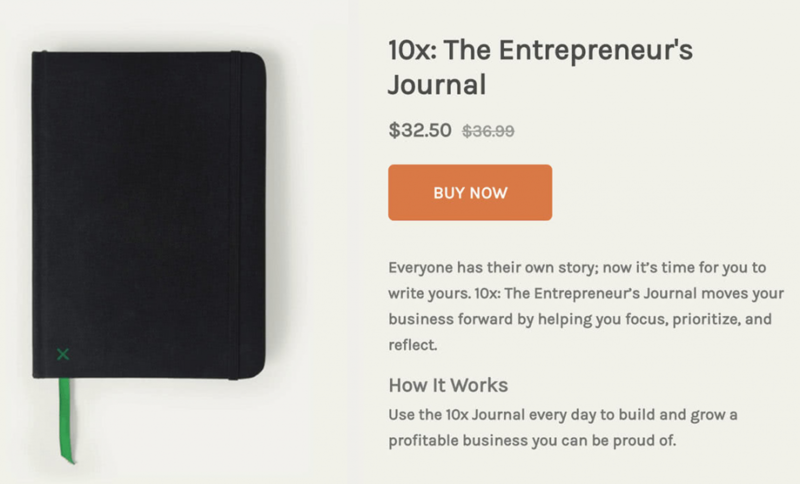 Shopify has a step-by-step and checklist to get you started. Shopify also has a 14-day free trial so that you can create and test your store before committing to a plan. Use a third-party payment gateway. If you do not want to use Shopify’s built-in credit card processing, you can also accept credit cards online using one of Shopify’s third-party payment processors including Authorize.net, Chase, Vantiv, PayPal, and Cayan. However, note that Shopify does charge an additional transaction fee if you use a third-party payment provider. Sample product page made with Shopify. In addition to accepting credit cards online, Shopify has all of the features that a business owner would need to create a sleek and efficient ecommerce operation. View the table below for a full breakdown of Shopify’s plan options broken down by pricing tier. To accept credit cards online with Shopify, you need to choose from one of their monthly plans that include an ecommerce store. The monthly price ranges from $29 to $299. Online payment processing rates vary from 2.9% plus 30 cents to 2.4% plus 30 cents depending on your monthly plan. You can try Shopify free for 14 days before deciding on a plan. Sample checkout screen made with Shopify. Shopify has excellent online reviews. Users like that the platform is efficient and offers an all0in-one solution for ecommerce businesses. It is also easy to use. The main downside of using Shopify to accept credit cards online is that rates can be very steep if you use a third-party payment processor. Otherwise, Shopify is a great solution for ecommerce businesses. Visit our Shopify review page for more feedback from business owners. Shopify is a sleek and streamlined solution for businesses that want to sell products online and accept online payments all from the same place. Shopify is one of the only payment providers on our list with a monthly fee, but that is because it includes an entire suite of ecommerce management and website building tools, making it a great value even with monthly fees. Click here to sign up for a 14-day free trial. 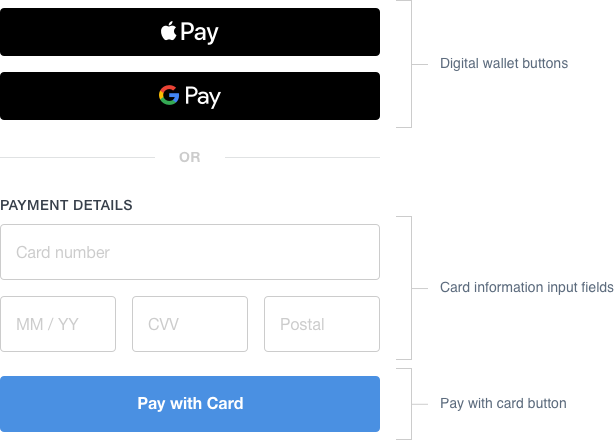 Stripe is a payment processing system that allows businesses to accept credit card payments online and is designed to handle more complex payment situations like subscriptions, recurring fees, and storing card data. Stripe is a great, secure way to accept credit cards online for businesses that want to create a custom solution. Stripe has a suite of APIs that allow businesses to choose how they want to accept credit card payments online. There are essentially three ways that businesses can accept credit cards online with Stripe: by integrating Stripe’s checkout, by creating a custom form, or by using one of their partner integrations. Simple checkout button. If you are not looking for a custom solution, Stripe checkout can be easily integrated into your website with a single line of code. This will create a blue “Pay With Card” button on your site. Use a partner integration. There are dozens of platforms that have extensions or plug-ins for creating Stripe checkouts to accept credit cards on your website. Stripe’s partners include WordPress, Wix, Weebly, and Shopify. Stripe has plug-ins for PrestaShop, WooCommerce, and more. Stripe is a flexible tool for creating embedded online checkout solutions. Stripe accepts many credit cards and payment methods including all major credit cards, Apple Pay & Android Pay e-wallets, automated clearing house (ACH) payments, and some cryptocurrencies. No monthly, startup, or cancellation fees. If you want or need a freelancer to help you set up a custom checkout for your website so that you can accept credit card payments online, visit Fiverr. It has a full directory of freelancers who are available for single projects at an affordable rate. You can view reviews of each freelancer and examples of previous projects they have worked on before making a decision. Click here to browse Fiverr’s freelancer directory for free. Overall, Stripe has great reviews. Users like that it is flexible and easy to use. Most negative reviews are regarding poor customers service, with some reviewers saying it can take several days for Stripe to respond to requests. Visit our Stripe review page for more feedback. Stripe is completely free to use. The code is available right on their website for you to drop into your site and start accepting credit card payments right away. Stripe also links to dozens of partners and plug-ins that are also free to use. Click here to visit Stripe and accept credit cards online. Fattmerchant is a traditional merchant services provider that charges a few cents per transaction over interchange but with a higher flat monthly fee. Fattmerchant’s unique pricing structure makes it a good fit for growing businesses that have a higher transaction volume and average sales amount because they would benefit from the lower per transaction cost. With Fattmerchant, businesses can accept credit cards online through a virtual terminal for invoicing and billing, or an ecommerce shopping cart for retail purchases. Sign up for a merchant account. Before you can start accepting cards online, you need to apply for an account with Fattmerchant. Like Dharma, they only work with United States companies and don’t work with many high-risk businesses. Set up your Authorize.net gateway. Fattmerchant works directly with a few payment gateway options, but the most popular is Authorize.net. This entire process is done through Fattmerchant, so you don’t have to contact a separate company to set up your payment gateway. Create a custom shopping cart. Fattmerchant lets you create a custom, branded shopping cart right on your website, so customers never leave your site during checkout, and the whole shopping experience is branded to your store. Connect with your website. Authorize.net has integrations with many popular ecommerce platforms and web hosting services like WordPress, WooCommerce, and Magento. Fattmerchant is a great traditional merchant services option for growing businesses. It provides options for accepting countertop payments, mobile payments, invoicing, and ecommerce, all of which are PCI compliant and integrate with many popular POS programs. Businesses can create one-time and recurring invoices through Fattmerchant’s free virtual terminal. Fattmerchant has a unique subscription-style pricing model where businesses pay $99 per month or $199 per month depending on whether your annual sales are more or less than $500,000. As far as monthly fees go for payment processing, this is the highest we’ve seen But, Fattmerchant only charges 15 cents or 12 cents on top of direct cost interchange fees, so if you have a medium to high transaction volume or your average transaction rate is higher, this pricing structure can save you a lot of money. Fattmerchant has pretty positive reviews. Businesses like that the fees are transparent and affordable. Businesses also like the month-to-month billing and that there is no cancellation or early termination fee. Some reviewers cite unprocessed applications or issues with card processing hardware. Visit our Fattmerchant review page for details. Fattmerchant offers competitive rates for growing businesses and has flexible processing options for multiple sales channels. To get started with Fattmerchant, the first step is visiting its website and either requesting a free demo or submitting your information to start the signup process. Visit Fattmerchant to get started. PaySimple is an integrated system for accepting credit card payments online, automating billing, and sending invoices through as a single portal. Pay Simple is a good option for small businesses, service providers, event managers, and nonprofits who need to collect both customer information and online credit card payments through a form-based system. With PaySimple, businesses can accept credit cards online by building a storefront, creating configurable payment forms, or embedding a “Buy Now” button. Payment forms are a great option for people that don’t want an online store, but still need to collect payments online for event registrations, nonprofits, memberships, and so on. Create a PaySimple account. Users can sign up for a new account instantly. There’s no approval process like with Chase. PaySimple also offers a free trial. Create your forms. You can create a registration form and choose what details each customer needs to enter, such as contact info or birthdate. Registration forms can store customer details in the included customer relationship management (CRM) system. Alternatively, you can create a recurring payment form for services and memberships. 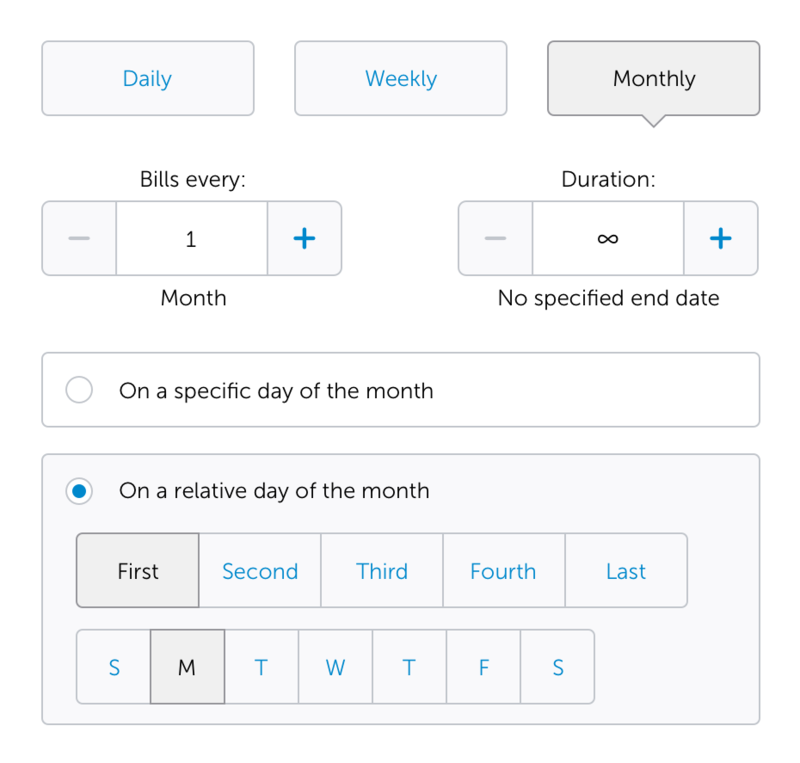 This option stores customers’ info and automatically bills at the designated time. Both solutions are PCI-compliant. Send to customers. With PaySimple, you can send customers a link to the registration form or send them invoices directly. Either way, you don’t have to create a whole website. 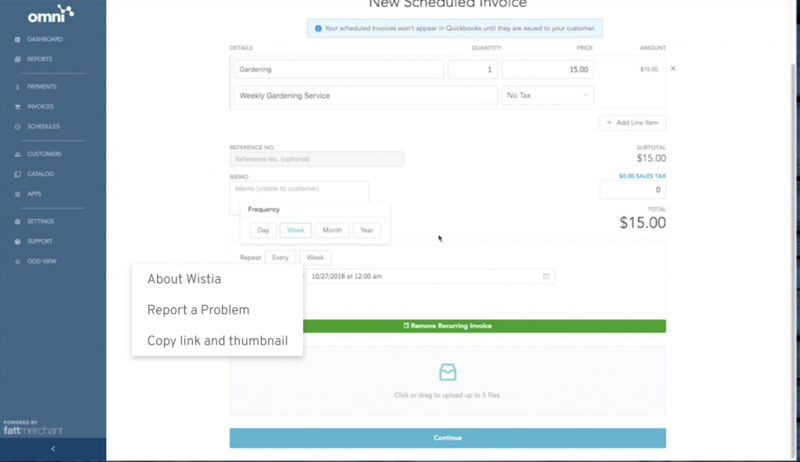 Sample recurring payment form with PaySimple. Without a website, managing form-based online payments can be tough. However, not if you use PaySimple. PaySimple’s standalone forms offer a unique solution for anyone needing to collect customer data and payments online without having a website. This clever solution allows you to collect, store, and manage user information and process one-time and recurring credit card payments. Best of all, it all happens on PaySimple’s secure, PCI-compliant system. PaySimple has a monthly fee and flat-rate transaction fees. PaySimple is $49.95/month and includes online payments, custom forms, invoices, and recurring payments in addition to extra features like CRM and reporting. Credit card processing fees are as low as 2.49% per transaction. ACH and e-check fees are 60 cents plus 10% per transaction. PaySimple has mixed reviews. Users like that the interface is straightforward and easy to use. It also provides a way of accepting credit cards online without a website and setting up recurring payments. However, some reviewers reported various issues ranging from higher fees than what was expected, withheld funds, and difficulty connecting with customer service. Visit our PaySimple review page for more details. PaySimple makes it easy to sign up and accept credit card payments online right away, even if you do not have a website. With PaySimple, businesses can create invoices, custom registration pages, and custom recurring payments for one flat monthly fee. Click here to sign up for a free trial. PrestaShop is our top choice for third-party shopping carts. Although many website platforms have built-in cart options, if yours does not, PrestaShop is a great solution that has more than 4 million downloads. PrestaShop is free to use and integrates with PayPal, plus other competitively-priced PCI-compliant payment providers. 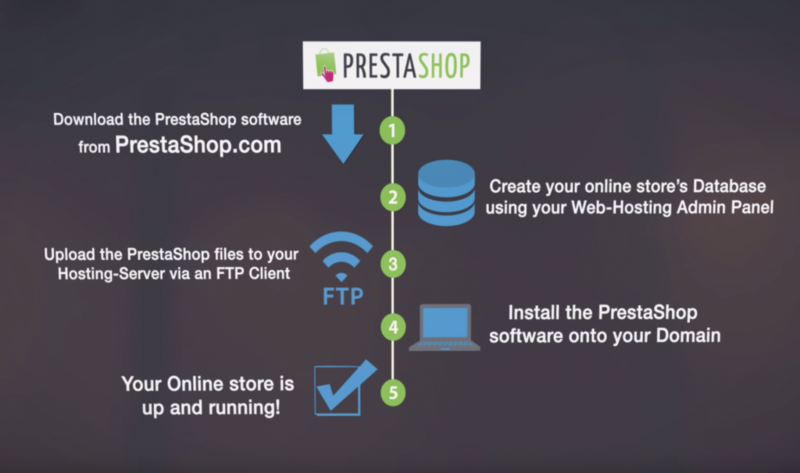 This guide and video tutorial series walk you through the process of setting up PrestaShop on your existing website. Here, we break down accepting credit cards online with PrestaShop in a few simple steps. Get a merchant account or payment gateway. Before we begin with PrestaShop, you will need an actual card processor. PrestaShop is a shopping cart interface that allows customers to buy from your site. Make sure your website is secure. Before accepting payments, your website needs to have an SSL, which is the standard for encrypting payment information. You can likely get this through our website platform. Download PrestaShop. PrestaShop is completely free to use and download. Upload PrestaShop to your website. Transfer the PrestaShop folder to the correct location on your website. From there, you should see the PrestaShop installer and be able to configure your checkout. It’s easy to set up an online shopping cart with PrestaShop. PrestaShop is a free platform that lets businesses manage the backend aspects of an ecommerce store, including the shopping cart. With PrestaShop, you will still need a separate merchant account to process the payments. However, if you have an existing website on a platform that doesn’t directly offer an ecommerce solution, and you want to add a shopping cart, PrestaShop is a great way to add a shopping cart so that you can sell products and accept credit cards online. PrestaShop is free to download and use. The only cost is your payment gateway and processing fees. Look for processors that have no higher than the industry standard 2.9% + 30 cents. Flat rate transaction fee. Reviews for PrestaShop are generally positive. Users like that it is free, has robust features, and can be highly customized. Some reviewers say that PrestaShop can be difficult to set up if you do not have any coding or web development skills. If that is the case, a plug-and-play or all-in-one solution like Square may be a better fit for you. Visit our PrestaShop review page for more feedback. PrestaShop is free to use and download so that anyone can get started with PrestaShop today. It’s a great solution if you want to add a shopping cart to an existing website. Click here to visit PrestaShop for your free download. Chase Merchant Services (formerly Chase Paymentech) is part of JPMorgan Chase Bank. When businesses use Chase Merchant Services to accept credit cards online, Chase serves as both the credit card processor and the receiving bank, which can speed up the transaction process and provide business owners greater peace of mind. Overall, Chase is a great option for businesses that prefer to work with a traditional bank rather than a third-party. Chase Merchant Services offers solutions to accept credit cards over a virtual terminal and ecommerce solutions to accept credit cards on your website. Open a merchant account. The first step is to set up a merchant account. Since you are working with a bank, the sign-up process is a little more involved than with plug-and-play solutions like Square or Stripe. Choose a gateway option. Chase offers a few different payment gateway options including their proprietary Orbital Gateway and the popular Authorize.net. Connect the gateway to your website. 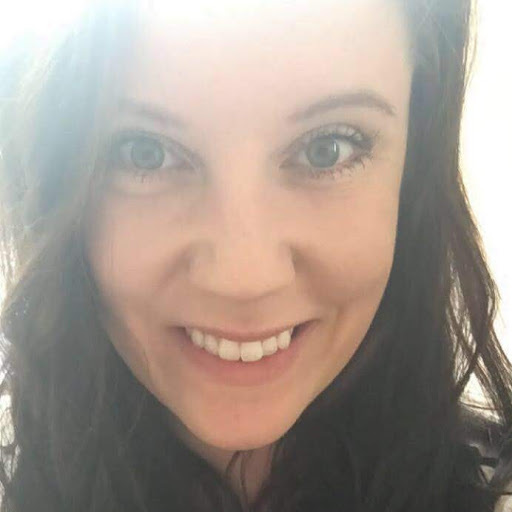 Once you have the Chase account and your payment gateway set up on the back end, you need to connect it to your website or ecommerce platform that will be the customer-facing side of your checkout. Chase’s pricing is entirely quote-based. Chase offers both flat-rate fees that are ideal for small businesses and interchange plus pricing, which is a good option for larger businesses. Actual rates can vary based on your monthly processing volume and other factors like how long you’ve been in business. Chase has no startup, monthly, or early cancellation fees. However, you will likely sign a long-term contract. Overall, reviews for Chase are good. It is rare for a credit card processor and bank of this size to have positive reviews, but Chase does. Most of the negative reviews cite either insufficient customer service or withholding funds. Overall, Chase has a tidy review record. Chase Merchant Services is a great option for businesses that want the trustworthiness and stability or working directly with a traditional bank. By working with Chase, your card processing and receiving bank are all together, making the process much smoother. Click here to open a Chase Merchant Services account today. There are many ways to accept credit cards online. The best way to accept credit card payments online depends on your individual business. If you are a sole proprietor that doesn’t sell retail but wants an easy way of charging clients, a simple virtual terminal with invoicing capabilities is a good choice. If you’re a small business that wants to do some online sales, a simple shopping cart integration can easily be added to your website. If you’re looking to establish an ecommerce business, an all-in-one ecommerce-specific platform with built-in payments is a good option. Overall, Square is a great all-in-one solution for accepting credit cards online. Square is a good fit for most small and startup businesses because there is no contract or monthly fee, no lengthy approval process, and it is super easy to start selling products online, via mobile, and in-store. Most small businesses can manage all of their product, inventory, customer, and payment functions in Square’s user-friendly platform. Click here to sign up for a free Square account and start accepting credit cards online right away. Thanks for reading! Glad the info was helpful. If you want to sell downloadable files from your website, give MadBeeTech Web Hosting a try. I like it because it’s a complete system – site builder, shopping cart, and automated handling of delivering purchased files to the buyer. Thanks for your input. We’ll check out their digital ecommerce hosting service for future pieces. Hi friend, also \”Stripe Payment\” is present, I use it with the mobile POS of miunic.com, it works me well. Stripe is indeed a popular option for online stores. 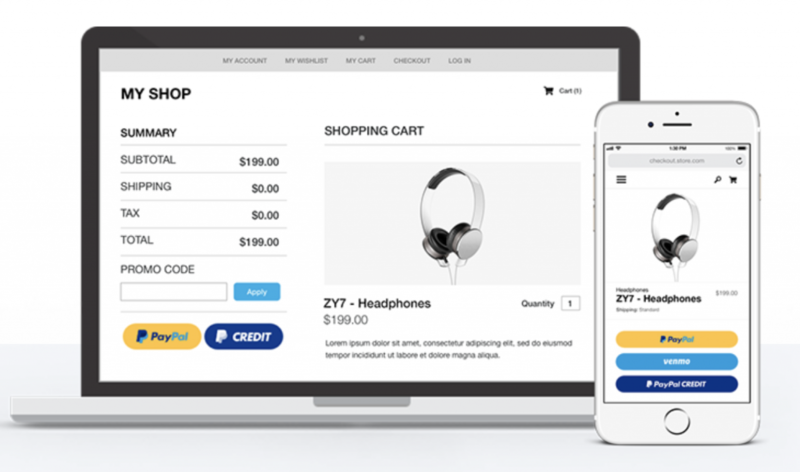 If you’re setting up an ecommerce store using Ecwid, Weebly, Wix, Squarespace or most other website builders, you can generally integrate Stripe and PayPal to process credit cards. Sometimes, I worry about being duped in some online transactions. What steps can be taken to check the security of online payments? Thanks for reading and commenting! Most top payment processors, including those we discuss above, provide fraud prevention tools that include security protocols like the ZIP/CSV match. Your payment processor likely offers these and using them is a good place to start. If you sell online long enough, you’ll run into someone who’s learned how to game the system, like ordering then issuing a chargeback for some obscure reason (trying to get the item free), but credit card companies crack down on this when they see it as a customer’s pattern. So that’s getting better. Some processors, like PayPal, also have seller protection which can help in cases like these, too. I hope this helps!